A solar tracker is a device that rotates an array of panels toward the sun throughout the day. A solar panel in a fixed orientation between the dawn and sunset extremes will lose 75% of the energy in the morning and evening. Rotating the panels to the east and west can help recapture these losses. Trackers minimise the angle of incidence between the incoming light and a panel, increasing the amount of energy produced. 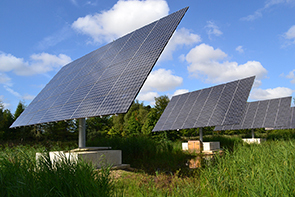 In standard PV applications, it is estimated that trackers were used in at least 85% of installations greater than 1MW from 2009 to 2012 internationally, however we are yet to see a great take-up of this technology in the UK. The selection of tracker type is dependent on many factors including; installation size, electricity rates, government incentives, land constraints, latitude, and local weather. Single axis trackers have one degree of freedom that acts as an axis of rotation. A tracker rotating in the east-west direction is known as a single-axis tracker. Horizontal single axis trackers are typically used for large distributed generation projects / solar farm projects. The combination of energy improvement, lower product cost and lower installation complexity results in compelling economics in large deployments. The inherent robustness of their supporting structure and the simplicity of the mechanism also result in high reliability which keeps maintenance costs low. Since the panels are horizontal, they can be compactly placed on the axle tube without danger of self-shading and are also readily accessible for cleaning. Dual axis trackers have two degrees of freedom that act as axes of rotation, accounting for both the daily and seasonal motions. They allow for optimum solar energy levels due to their ability to follow the sun vertically and horizontally. No matter where the sun is in the sky, dual axis trackers are able to angle themselves to be in direct contact with the sun. Dual axis trackers are typically used in smaller installations and locations with very high electrical requirements, to maximise the system’s output.